Sigelei is a well-known company in the vaping industry and has released many devices which have become the favorites of many vapers. Some of their box mods such as the original Sigelei 150w is still going strong for some vapers. Now, they have released their newest device, the Kaos Spectrum 230 TC Box Mod which features a unique LED ring, temperature control, a large color display screen and much more. How does this new box mod compare to the tons of other dual 18650 devices on the market? We’ll see in this review! Before getting any further, I would like to thank Breazy for sending this box mod our way for the purposes of this review. I’ll go over my first impressions, usage, performance, pros and cons, and conclude with whether or not I recommend the Sigelei Kaos Spectrum! The Kaos Spectrum Box Mod comes in a relatively simple yet attractive box. Once you slide open the packaging you are immediately greeted with the device itself, and underneath houses the included micro USB cable and user manual. The color received is the blue variant, but there are other colors available such as black, white/black (also known as the “Stormtrooper color”) and gunmetal. The blue finish is more of a dark blue, and one I’ve yet to see with other devices. 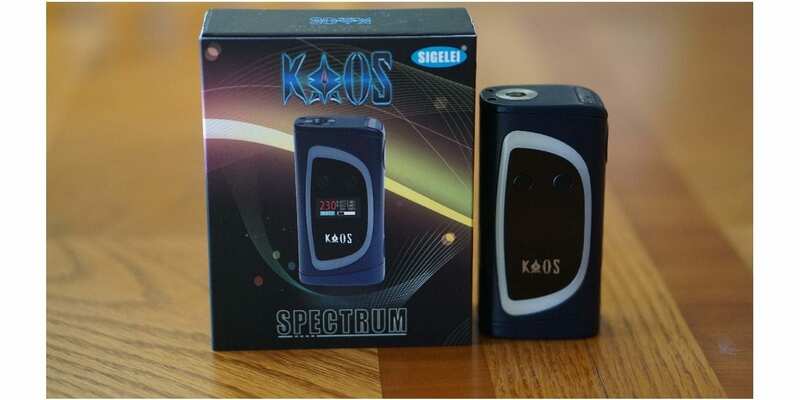 Upon holding the Sigelei Kaos Spectrum it felt comfortable right away. All of the edges are smooth, and everything just feels well rounded. The overall size is good for a dual 18650 box mod in my opinion. 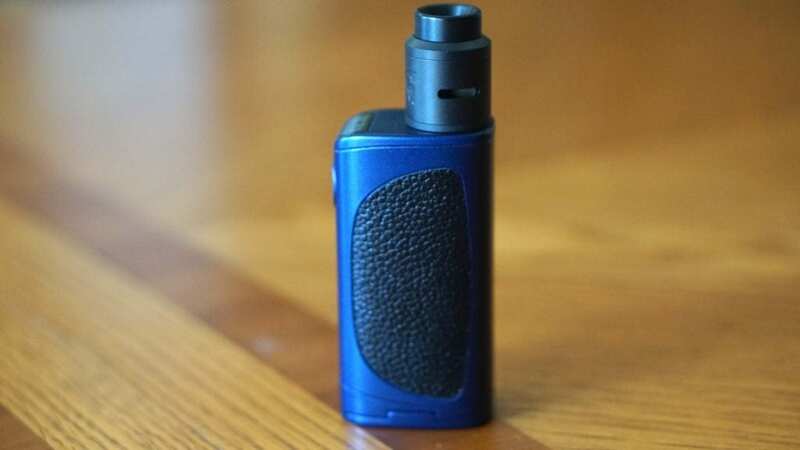 The design itself is slightly similar to the Sigelei 213, but there are some differences to it. This box mod is primarily constructed of zinc alloy; therefore it is quite light without any 18650 batteries installed. On the front of this device is where the LED color light bezel, and the screen in the middle. The wattage up and down buttons are located right above the screen. On the back of the device, there is a piece of leatherette, and it does add some comfort while you are holding it. I’m not to keen on the looks of it, but it does feel great when holding the mod in your hands. On the top of the box mod, there is a section in black that highlights the name “Spectrum”, which I do think is a nice touch. There is a micro USB port located at the side of the vape mod, where you can upgrade the firmware or charge the batteries. However, we do highly recommend you charge your 18650 batteries with an external vape battery charger. One thing I did notice right away with the Sigelei Kaos Spectrum is that when there are no batteries installed, the battery door is quite loose. This is a con to me, but when there are batteries installed, it tightens up with little to no play. I would’ve liked the battery door to be a bit more solid without batteries installed. Overall, my first impressions of the Sigelei Kaos Spectrum was great! There was one small con that was mentioned, but it wasn’t a deal breaker by any means. As mentioned previously, the Sigelei Kaos Spectrum is quite comfortable to hold as all of the edges are rounded. There are no sharp points whatsoever on this box mod, which is a huge pro in my opinion. Also, this dual 18650 box mod isn’t large nor is it too small. Personally, it’s the right size for this type of device, which makes it even more comfortable to hold. The fire button is nice and clicky as well, which I know is something many vapers enjoy. This device is also very easy to carry in the pocket, and I had no issues with it whatsoever. For our female subscribers, you’ll have no worries lugging this in your purse. For those vapers looking for something ultra compact, then this might not be for you. Inserting the batteries is extremely easy, and the battery door simply opens by pushing and sliding the door forward. The positive and negatives are clearly marked, and your 18650 batteries easily slide into position. Closing the battery door is as easy as opening it, and once the batteries are secured into place, the battery door also becomes more secure. Five clicks will turn the Kaos Spectrum on and off. Once you do turn on the device, you’re greeted with a beautiful color display screen (0.96 inch). It’s incredibly easy to see, and read. Depending on the wattage, the wattage number will go from green to yellow to red. The screen itself displays your set wattage, what mode you are in, resistance, amperage, battery bar and percentage, volts of both your batteries, and the applied voltage (determined by the resistance and wattage). Holding the wattage up and fire button will allow you to adjust your preheat setting. In addition, holding the wattage down and fire button will lock the buttons. Three clicks will bring you into the menu where you can access your temperature control functions, and customize the LED light ring. You can turn the light ring completely off, light up when using, or always on. The colors for the LED light include blue, red, yellow, green, purple, and cyan. The cyan color is definitely the brightest of the bunch. The temperature control options are SS, Ti, Ni200 and a TCR mode. If you click the TCR mode, you can select from 5 different settings, once you do choose one, you can then adjust the TCR value. This is a very simple to use menu system, which is a huge pro in my book. Another pro is that you can lock your resistance by clicking the wattage up and down buttons. I do want to mention that the menu system can be a bit sluggish at times, and takes a bit to register 3 or 5 clicks. Even though it’s very easy to navigate, this was certainly an annoyance when it occurred. So, for me, this is a con. Something else to mention is that there is some button rattle, but it’s not unbearable by any means. Atomizers up to 25mm will sit flush with no overhang. In addition, all of my atomizers I’ve attached, including some with very protruding 510 pins sat flush with zero gaps. This is yet again another pro for this device! All in all, using the Sigelei Kaos Spectrum 230w Box Mod has been a pleasure, even though I did have an annoyance of the menu system being a bit sluggish at times. This was a very comfortable dual 18650 device and was just easy to use. 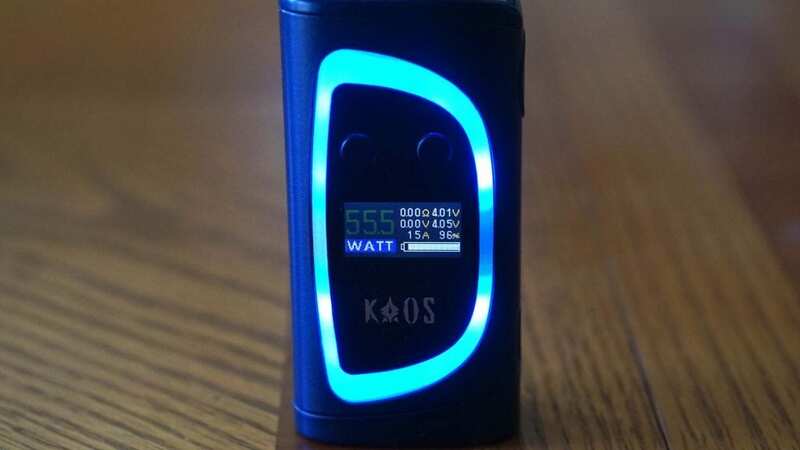 The Sigelei Kaos Spectrum has a maximum wattage output of 230w, and a maximum voltage output of 7.5v. I don’t have the necessary equipment to test whether or not this device can actually hit that high of a wattage, but at the wattage I would vape this device at (between 50w and 100w), it felt pretty close to the power it was delivering. I must say that the wattage did feel a bit weaker in comparison to a DNA250 or YiHi SX 450J. However, it didn’t feel that much weaker, just about 5w-7w below the wattage I set it to. With that being said, it wasn’t much of an issue for me, and you may not even notice it too much while vaping. Once you do hit the fire button, it fires almost immediately. It’s not the fastest firing I have experience with a dual 18650 device, but it is pretty fast. However, I did have some misfires happen, where I would press the fire button and nothing would happen. This is definitely a con in my book. Thankfully, this didn’t happen too much, only once in a while. Regardless, it’s still a con to be mentioned. 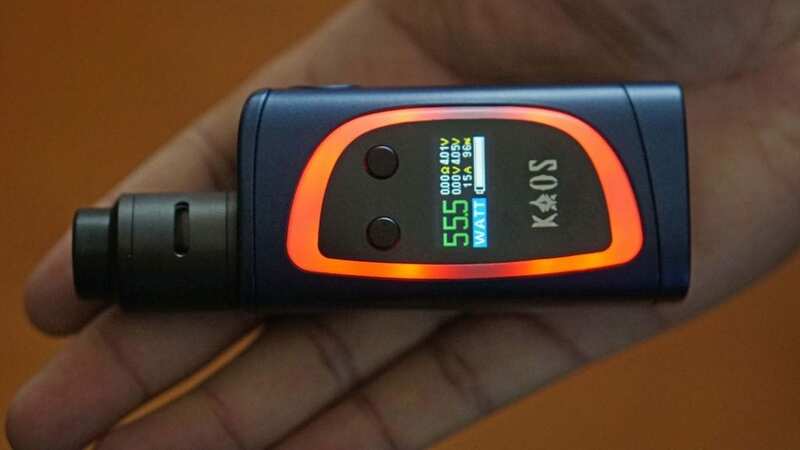 As mentioned earlier, the Sigelei Kaos Spectrum features temperature control for Ni200, Ti and SS wire (304, 316, 317). There is also a TCR mode with 5 different memory presets, which is a great addition to any device. I did test this device in SS temperature control mode, and it worked fine. It didn’t work as great as a DNA250 device, but it did work pretty well, especially in TCR mode. I much preferred the TCR mode in comparison to the standard SS temperature control mode this device has. The minimum firing resistance of this device is 0.1 ohm, which is enough for the majority of the vapers out there. I did test this device with a 0.1 ohm resistance, and it fired it with zero issues. The battery life of the Sigelei Kaos Spectrum was pretty good, especially with 2 Samsung 30Q 18650 batteries. I could easily get through most of the day with the LED light turned completely off. However, once you turn the LED light on, your battery life will suffer a bit, which is to be expected. If you do decide to leave this feature on, I do recommend bringing a spare set of 18650 batteries. All in all, the performance of the Sigelei Kaos Spectrum was great. It wasn’t the absolute best performing dual 18650 device, but when considering its price, it did perform quite well. Here’s a quick video on the mod…. In conclusion, the Sigelei Kaos Spectrum is a good dual 18650 device that offers a unique feature, the customizable LED light ring. While some vapers will surely find this gimmicky, some vapers may actually find it attractive. This device has tons of other features as well such as multiple temperature control functions, resistance lock, large color display screen, preheat function and more. As mentioned previously, it’s not the best performing dual 18650 device on the market, but for the price, it does perform great. In addition, there were some minor quirks, but nothing that were a complete deal breakers. In wattage mode, which is what I used mainly, it had zero issues and simply worked. If you’re a fan of the LED light ring or looking for a unique dual 18650 device that has tons of features and is comfortable in the hands, then you can’t go wrong with the Sigelei Kaos Spectrum 230w TC Box Mod, especially when you consider its price. We hope you find this review helpful in finding the right device to fit all of your vaping needs! Feel free to leave any questions or comments down below! Thanks for reading!